How to maximize value and avoid pitfalls when transitioning your operation to group housing. The transformation from individual gestation stalls to group housing is now underway throughout the Canadian swine industry. Many producers may worry that it will be difficult to maintain the consistency and level of productivity currently expected of modern commercial sow farms. Regardless of the feed system chosen, managing gestating sows in pens poses new challenges for, and requires a rethink from, producers, nutritionists, veterinarians and farm employees at the slat level. However, an optimist may argue that group housing may also force us to instill more stockmanship into our farm caretakers. At least we can take solace in the many international examples of producers who have shown that group-housed sows can perform at levels equivalent to sows managed exclusively in stalls. 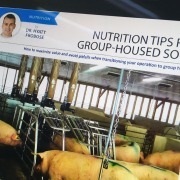 As a nutritionist helping producers through this transition, I am fortunate to be able to offer not only a fresh perspective on feeding gestating sows effectively but also to provide a trained eye to help avoid the nutrition management pitfalls most likely to occur in group-housed sows. First, let’s consider the primary challenges that producers face when managing sows in pens. The major ones that come to mind are aggression between sows at initial mixing, food-directed aggression around the feeding and drinking areas, and challenges with lameness. These challenge areas can be minimized by providing sufficient space, designing the pen layout and slat configuration appropriately, and properly managing the timing of mixing events. Proper sow nutrition also plays an important role. Historically, gestating sows have been limit-fed a single diet to prevent them from becoming over-conditioned and to minimize annual feed costs. Nonetheless, a gestating sow’s appetite often results in sows fighting over feed in competitive feeding systems, such as floor feeding and shoulder stanchions. Her appetite can also result in aggression around entryways into non-competitive feeding areas, such as ESF (electronic sow feeders) and free-access stalls. Luckily, gestating sows are the stage of pig production where fibrous feedstuffs can be most efficiently utilized. Sows have a fully developed large intestine which can digest and absorb energy from soluble fiber sources. So, producers have the opportunity to lower feed costs by incorporating grain by-products, such as soybean hulls, wheat middlings and DDGS (distiller’s dried grains with solubles). These alternative ingredients have a lower bulk density, which means sows must consume a greater volume of feed to match the calorie content of a traditional corn-soy diet. From a group-housing standpoint, this increased bulk provides the added benefit of increasing the satiety of sows, resulting in sows spending a greater amount of time lying down and digesting, rather than competing with other sows for additional feed. Finally, a higher fiber gestation diet has also been shown to help increase feed intake as sows transition into farrowing. While these ingredients can be useful tools, it’s also important to remember that they are variable in quality and nutrient content, and producers and nutritionists must actively monitor these grain by-products to avoid unintended negative effects. Depending on the pen design, producers and nutritionists must also consider the environmental effects of housing on a gestating sow’s nutrient requirements. For example, sows housed in large pens with ESF stations must travel farther to and from the feeding area, thereby having higher activity levels and expending additional calories compared to sows immobilized in gestation stalls. But group-housed sows also tend to lay together and thereby reduce their maintenance requirements for generating body heat compared to stalled sows. Consequently, researchers are trying to determine if producers can reduce dietary energy levels or barn heating costs by lowering the ambient temperature of group-­housed sow areas. Sows’ feet and leg health also have to be considered in order to achieve optimal herd performance in group­-housed sows. I often find these health considerations to be the biggest challenges during the initial transition. While adequate skeletal conformation is an initial prerequisite for entry into the breeding herd, lameness and mortality caused by aggression, flooring type, and/or inadequate nutrition (diet formulation or off-feed events) are often the biggest detractors in a group-housing system. Gestation diets may need to be reformulated to increase micromineral concentrations, such as zinc and selenium, as well as vitamins, like biotin and choline, to provide a protective buffer for hoof and joint health. I recommend you consult your herd nutritionist to ask what supplements are available and the associated economics of their inclusion in your feed program. Fortunately, one of the most common mistakes made in pen gestation barns is also the easiest task to remedy. I mentioned bulk density earlier and this element plays a significant role in maintaining proper sow body condition. In most gestation feed systems, the box drops (free-access stalls, floor feeding and stanchions) or ESFs and free-access ESFs are calibrated on a volumetric basis. Too often, producers and nutritionists make diet changes without informing barn staff of the change, or particle size varies markedly from load to load and feed drops are not re-calibrated frequently enough to ensure sows continue to receive the allocated amount of feed. On a recent farm visit, a change in feed ingredients led to a 35 per cent reduction in bulk density, which meant that sows intended to receive 2 kg ( 4.4 lbs) of feed per day had only been receiving 1.3 kg (2.9 lbs) per day, which explained the poor body condition seen in a high percentage of the pigs. Develop a feed drop calibration routine in pens (and in breeding stalls) at least once per month and stick to it! On the brighter side, feeding sows in pens also creates some new opportunities to deliver precise nutrient levels to individual sows that were not available in previous gestation stall configurations. In most stall barns, a single feed line is used to deliver feed to all females, regardless of parity, and only the amount of feed provided can be altered. However, it is well documented that gilts and young sows have the highest nutrient requirements, as they are still growing themselves. Older sows, in contrast, only need the minimum requirements for maintenance and pregnancy development. Since sows in pens typically have lower aggression and lameness issues when segregated by parity, the transition to group-housing offers an opportunity to feed a dedicated diet to gilts and young sows, and a separate, lower-cost diet to older sows. This targeted feeding can be clone with dedicated feed lines to specific pens, or by utilizing two feed lines and blending different ratios of diets using electronic feed systems according to sow parity and body condition. This recently developed feed blending technology also affords nutritionists opportunities to phase feed sows in gestation by altering dietary amino acid and energy content per stage of gestation. Researchers are endeavouring to determine the optimal and most cost-­effective way to present feed to the gestating sow. Furthermore, blending two diets also allows nutritionists to take a fresh look at opportunities for targeted inclusion of feed additives or medication during specific stages of pregnancy. This presentation may be more cost-effective than previous feeding methods, where the additive needed to be included throughout gestation or producers had to manually top-dress the ingredient during feeding times. 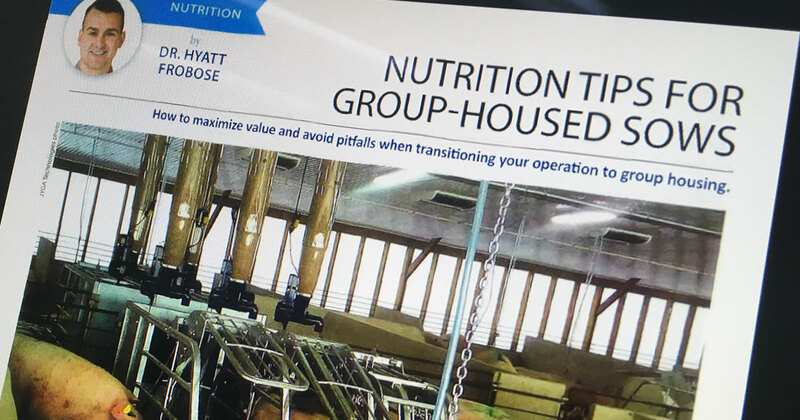 This article is by no means an exhaustive list of the nutritional challenges and opportunities that producers face when converting to group-housing. Based on my own experience, these elements seem to be the most likely things to be overlooked or mismanaged, which can result in serious economic and animal welfare consequences. Dr. Hyatt Frobose is the swine nutri­tion specialist with JYGA Technolo­gies. He completed his Ph.D. in swine management and nutrition at Kansas State University.